The quarter-final line-up for both the men and the women looked great on paper, but the last few days have been a little flat. Is it just me who loses interest at the end of tournaments when all my favourite players have all gone out? Generally, I much prefer the early stages of a tournament when there is so much going on. All four of the men’s quarter-finals were decided in straight sets. From Wednesday’s quarter-finals, the two highest seeds in the top half, Novak Djokovic and Stan Wawrinka progressed into the semi-finals. Based on what the pair have produced during their last two encounters in Melbourne, this could be the match that this tournament needs to shake it into life. Wawrinka’s quarter-final against Kei Nishikori was widely expected to be a cracker, but Wawrinka won very comfortably. I completely underestimated Stan in this match and I didn’t expect him to bring such a high level to the table. Wawrinka beat Nishikori, 6-3 6-4 7-6 (6). There were good chunks of high quality tennis in this match and I got to watch the third set. Wawrinka’s intensity from the baseline was really quite something and that backhand… I liked that Nishikori tried something different in the third set and he won a couple of service games to love with some competent serve and volley. Apart from an early break (which was quickly recovered by Wawrinka), Nishikori barely got a sniff on Stan’s serve. Wawrinka went up 6-1 in the third set tiebreak, but Nishikori managed to save five match points to level up at 6-6. It was a mixture of tightness from Stan and Kei upping his game. Unfortunately, a missed drop shot in the next point was the clincher and Wawrinka served out an ace. The drop shot was a good idea with Wawrinka so far behind the baseline, but it wasn’t executed well. Unfortunately mistakes do happen in the heat of the moment. 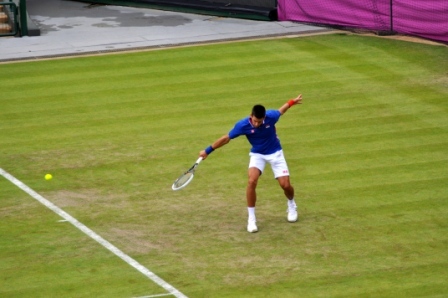 Djokovic continued his menacing run through the draw with another straight sets win, 7-6(5) 6-4 6-2. In hindsight, predicting Milos Raonic to win a set against Novak Djokovic was pushing it. Djokovic didn’t face a break point throughout the entire match and hit half the amount of unforced errors as Raonic. He has sailed through that the draw, but that could work against him if Wawrinka brings his A-game. On the ATP tour, the Djokovic v Wawrinka match-up has been very one-sided. It’s a whole different story at the Slams though with their last three matches going the distance. Both previous matches in 2013 and 2014 went into extra time and delivered some sensational tennis. Djokovic won in 2013, 1-6 7-5 6-4 6-7(5) 12-10 in five hours and two minutes. The pair saved their very best tennis in the critical moments of the match with an incredible and almost perfect match point. Wawrinka exacted revenge in surprisingly similar fashion, another epic five setter, 2-6 6-4 6-2 3-6 9-7 that lasted exactly four hours. Sandwiched between the two stunners in Melbourne, Djokovic came from two sets to one down to beat Wawrinka in the semi-finals of the US Open in 2013. It might be too much to expect the pair to produce another classic in Melbourne, but i’m excited about this match. If Stan can bring the level he brought against Nishikori then wow… This could be another special match. 4 sets. It could go either way though. Wawrinka is the more confident player right now. But he’s being asked to follow a HUGE win from last year. Part of why he’s done well this year is probably because expectations for him were pretty low, even as the defending champion. Now people are going to expect him to be a match for Novak and he isn’t, really. Having said that, Djokovic looked tense and uncomfortable in the first set against Raonic and he can’t afford to start like that here. Novak for sure look how Thomas flop last night. His serve and game left him last night. Just horrible from Thomas. I am a stan’s fan. I think Novak has easy draw in this tournament. Raonic was not a good match up in the QF. Stan is another animal. His single backhand is the best on tour and able to hit anywhere as he wishes. In fact, Raonic could win at least a set if his backhand could hit down the line. This is not an issue for Stan so I think Stan will make Novak runs in the SF. I go with Stan. It’s not only you who loses interest, I do to. There’s always a match to watch in the early rounds, whereas in the later stages of the tournament you”ll frequently find yourself waiting for a match to start, like I do now. I’m a Stan-fan, but also a pessimist, so I actually expect Stan to win a set at most. Playing an epic three years in a row might be a bit too much to ask. I want Stan to win of course, but I don’t think that’s going to happen. I’m preparing for disappointment already. @Inge you are a Novak’s fan that being nice….NAH! Haha no I’m seriously a Stan fan, just pessimistic ^^. I agree. I expect him to win a set but no more although I want him so much to win again. I’ve always liked him (even before the AO Round of 16 match against Djokovic) and was so delighted a fav of mine finally won a grandslam. That was epic although I somehow “hated” that Nadal was injured. The match was lackluster and boring. Stan got tired in the 5th set and got bagel. Andy has a chance and could win this title. I will say Andy is the favorite to win this title. Novak needs to step his game up or he is going home. I do however think that the lacklusture performance will make him twice as deadly in the final than if he’d cruised. I think Djokovic in 4 sets.